This is my .vimrc file. Since then I've been tempted away by a few shiny IDEs but always give up and come back to the venerable editor (one exception to this is intellij as it's a wonderful refactoring-engine for Java. By comparison Pycharm is rubbish IMHO). And so I thought it might be useful to post about my .vimrc file explaining what the various plugins and configuration options do. Since I've been writing a lot of python over the past year there's a bias here. If you want to skip to the goods you can clone my dot-files repo and run vim.sh to download and install all of the plugins below. If you don't have vim-8 installed all the plugins except ALE will work anyway. Let's start with Vundle: a plugin manager for vim that also fetches plugins straight from Github. We start by setting the runtime-path (where Vundle will download the plugins files). NERDTree is for exploring the file-system and is sometimes useful for jumping between files in your current project. Personally I don't like this being open on-startup. to open a file under the cursor in a v-split pane hit s.
ctrlp is the most useful way to navigate between files while working on a project IMHO. :Gdiff: see diff output for the current file. we're using fugitive to display the git branch in the status line with the lightline plugin (see below). the python-virtualenv in use (more on this later). Many people use syntastic for syntax highlighting in vim. It has one drawback which is that it runs synchonously in the main UI thread. ALE (Asynchronous Lint Engine) is arguably an asynchronous successor. ALE let's you specify specific linters for different languages. Below I've specified flake8 for linting and autopep8 for fixing syntax "errors". any config for either in ~/.config/pep8 or ~/.config/flake8 will be respected. Here are a few plugins that are great for python specifically. jedi is probably the best auto-completion library for Python that I've ever used (including Pycharm). jedi-vim requires that your vim binary was compiled with the python/python3 option but that's pretty much guaranteed unless you're compiling vim yourself. As a bonus: leader+b is remapped to add a pdb-breakpoint. vim-virtualenv allows you to set the python-virtualenv used in vim (and by extension jedi-vim). You can set/unset it with :VirtualEnvActivate virtual_env_name or :VirtualEnvDeactivate. Personally I find tags of limited use, but they're handy for exploring a new or otherwise un-familiar codebase. Here we use tagbar.
" --- C-tags integration --- "
Then we can toggle the tagbar window with :Tagbar and navigate code at a higher level of abstraction, as shown below. Honourary mention to vim-go and rust.vim which provide great integration for those languages too. It's possible to set the colour-scheme directly in vim but these days most terminals (terminator for linux and iTerm2 for mac) have solarized colour schemes baked in. Once set, vim will use these and the job is done. 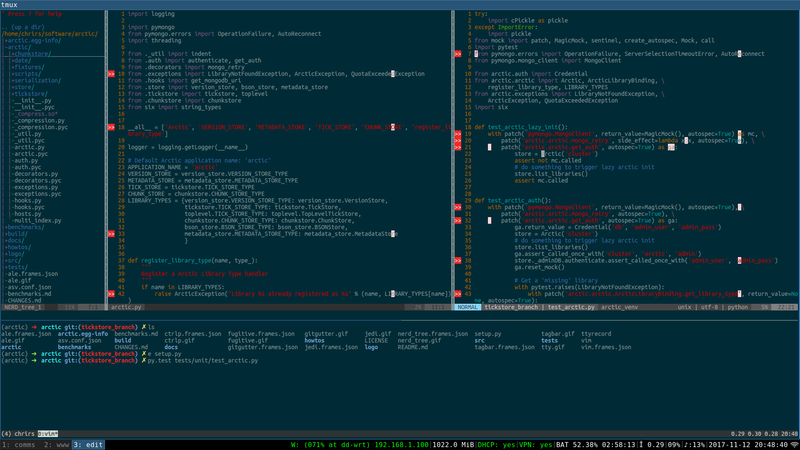 On a different note, tmux is a wonderful way to multiplex teminal sessions and I find it complements vim very nicely. I could probably fill an equally lengthy post about tmux. you can read from stdin via a UNIX pipe with vim -, e.g. Warning: this section is opinionated. You might ask: why bother with all this? Surely [insert GUI-based IDE + whatever else] is good enough? Well, it may be good enough. But often when working on some data-analysis or building some service what matters far more than the length of time spent working is how long I can spend in a state of flow. This usually means being focussing on one thing; being un-distracted. Using this editor is a great way of staying focussed and minimising the operational overheads of software engineering. So in a way these plugins and hotkeys are a way of making it easier to stay in the flow. Most package managers will distribute binary versions of vim 7.4.XXXX which is fine. There are many reasons to update to vim version 8.X is but perhaps the biggest is that it allows tasks to be performed outside the main UI thread. All of the plugins we'll discuss will work fine with either version except for the ALE plugin that requires version 8+. Also, certain commonly-enabled compilation flags (python and persistent_undo are assumed). Putting it altogether, what I focus on while working usually looks something like this. If you've made it this far I hope found it useful.